Asking yourself what your main use of the vehicle will be is a great place to start in deciding what make and model to look for. Consider scheduling a time to discuss with your mechanic what vehicles do well based on your needs and budget. Your budget should be about more than just the purchase price. You also have to consider how much you are able to spend on maintenance and repairs every year. For example, we recently had a family in the shop who just bought an SUV at a really good deal. For them, this seemed like a great fit for their driving needs and limited budget. What they didn’t know is that the vehicle’s engine is large with little room to work (think increased labor hours), a complicated timing system, and spark plugs which are known to break easily. So, while they got a good deal on the purchase price, they are likely looking at higher repair bills throughout their ownership of the vehicle. Some dealers do an inspection and repairs in house and may not let you take the car to your mechanic. If an inspection or repairs were done, they may not have been done to your mechanic’s same standards. When Andrew worked at a used car dealer, he observed that mechanics working under the same conditions had widely varying “comeback” rates. Certain technicians had twice as many vehicles returning for additional service as others. Dealers may invest into completely refurbishing the vehicle, including cosmetic fixes, raising the sale price. If you are more concerned with functionality than how your car looks, this will be an unnecessary added expense. Many used car dealers have a set price on each vehicle and their salespeople do not have the authority to negotiate. If the vehicle is not priced reasonably, you end up paying more than market value. You don’t have to worry about legalities. You are buying from a business which must be licensed and adhere to state and federal laws. The dealer handles the financial, tax, and registration paperwork. Many times any repairs needed are done in-house and are often under warranty for at least 30 days after purchase. Many used car dealers have a set price on each vehicle and their salespeople do not have the authority to negotiate. If priced reasonably, this shows they know the value of what they are selling and can save you negotiating time and stress. You most likely do not have a prior relationship with the seller and must be cautious about when and where you meet them. If possible, meet in a visible public location. If you must meet them at a private residence, do so during daylight hours and bring along a friend. It takes more of your time to make a wise decision and purchase. From the research, to the pre-purchase inspection, and paperwork to post-purchase repairs, you have to put a little leg-work into it. You can take the vehicle to a mechanic you know and trust for a pre-purchase inspection. (If they don’t let you do this, see it as a red flag and walk away). Any needed repairs can be done by your own mechanic after purchase. Plus, you can schedule repairs based on urgency and your budget – unnecessary cosmetic repairs are up to you. Because you put more legwork into purchasing the vehicle (i.e. paperwork), you save money on the fees the dealer charges for these logistics . It’s generally easier to negotiate price. If you’ve done your research and have a good idea of the value, this can work in your favor. A reasonable seller may even adjust the price if the vehicle is found to need a substantial amount of work. 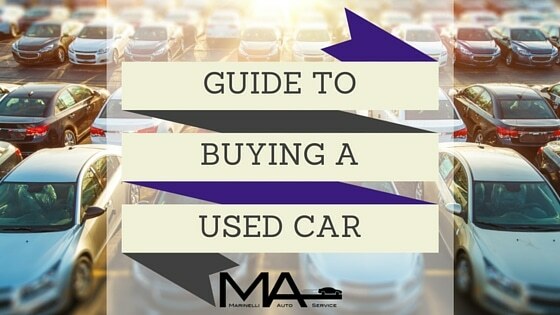 When you find a car you think you want to purchase, take some time to research the vehicle. Search the VIN to be sure it matches up with what’s on the title. Research price comparisons for vehicles of the same year, make and model through Kelley Blue Book and/or Edmunds. Keep in mind, market value is not always a true indicator of the worth of the car, but it could give you a starting point for comparison. Consider purchasing a vehicle history report, especially when buying from a private party and/or if the car has had more than one owner. 4. Get a pre-purchase inspection! One of the biggest mistakes people make when buying a used car is not having a thorough inspection by a mechanic they trust prior to purchase. A few months ago a customer brought in a recently purchased car. His budget was very limited, and he was just looking for something in good enough shape to get him from home to work. So, he got an older car and, while the paint was faded by the Florida sun, it seemed like it would serve his purposes. What he didn’t know was what Andrew had to tell him after an inspection…that it wasn’t just a few small repairs, but several repairs far beyond the customer’s budget or reasonable expense given the vehicle’s condition. A few months later, the vehicle broke down with a seized engine; this pushed the repair cost even higher, and the car was soon towed to a scrap yard. This could have been avoided if the vehicle went through a pre-purchase inspection and the purchaser was advised of the major costs in getting the car safely running. Happy car hunting and don’t hesitate to contact Andrew to talk through your options.